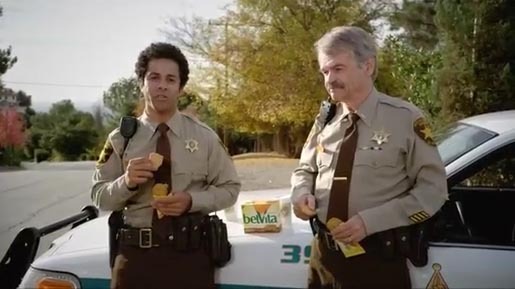 Kraft is using the Super Bowl to launch belVita Breakfast Biscuits in the U.S.A, calling on America to “Power Up, People.” The Breakfast Police commercial, launched during the Super Bowl pre-game show, shows two local policemen whose breakfast powers up a super patrolling day. Kraft is working the National Association of Police Organizations (NAPO) to ship belVita Breakfast samples to 128 police groups across the USA before the product hits store shelves. The USA launch was developed at Crispin Porter & Bogusky. Filming of Breakfast Police was shot by director Miguel Arteta via Bob Industries.